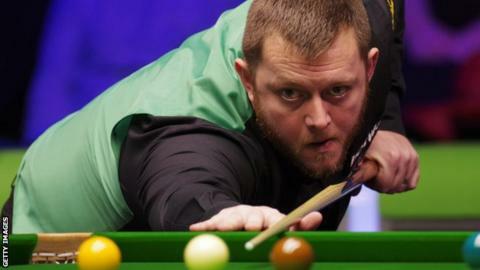 Northern Ireland's Mark Allen has insisted that focusing on his family helps make losing "a little bit easier". The Antrim man lost 10-6 to Ronnie O'Sullivan in Sunday's final of the UK Championship in York. Allen had young daughter Harleigh in his arms while speaking to the media after the defeat. "Look at how happy she is and she doesn't even know that I have lost," he said. "She makes losing that little bit easier. As much as snooker is very important to me, my family is more important. "If I win or lose, it's not the end of the world. Don't get me wrong, when I'm out there I will do absolutely everything I can to try and win, but this is what is important right here." Allen is the current Masters champion and will begin the defence of his title with a first-round match against Belgian Luca Brecel on 13 January at Alexandra Palace. The 32-year-old is very happy with his form as he looks to successfully defend the trophy he won with victory in the final over Kyren Wilson at the start of 2018. "I feel my game is in good shape at the minute and I'm confident I can compete for every tournament I play in," he continued. "I feel like I've got many more wins in me. It would be the ultimate to defend the Masters title. "I'm determined to finish off the calendar year well but then I can look forward to getting back to Alexandra Palace. "I'm sure it will be weird playing Luka in the first round but it will bring back a lot of good memories and I'm looking forward to it." While disappointed to lose to O'Sullivan in Sunday's UK Championship final, Allen was quick to praise the five-time world champion. O'Sullivan retained his title to move to 19 World, UK and Masters trophies - surpassing Stephen Hendry's record in the 'Triple Crown' events. The victory also took him to seven UK Championship titles, meaning he has overtaken Steve Davis' previous record of six. "I congratulated Ronnie at the end, not just on the tournament win but on breaking the records also," Allen added. "It shows where Ronnie is in the game. I don't think there is any doubt that he is the greatest ever."